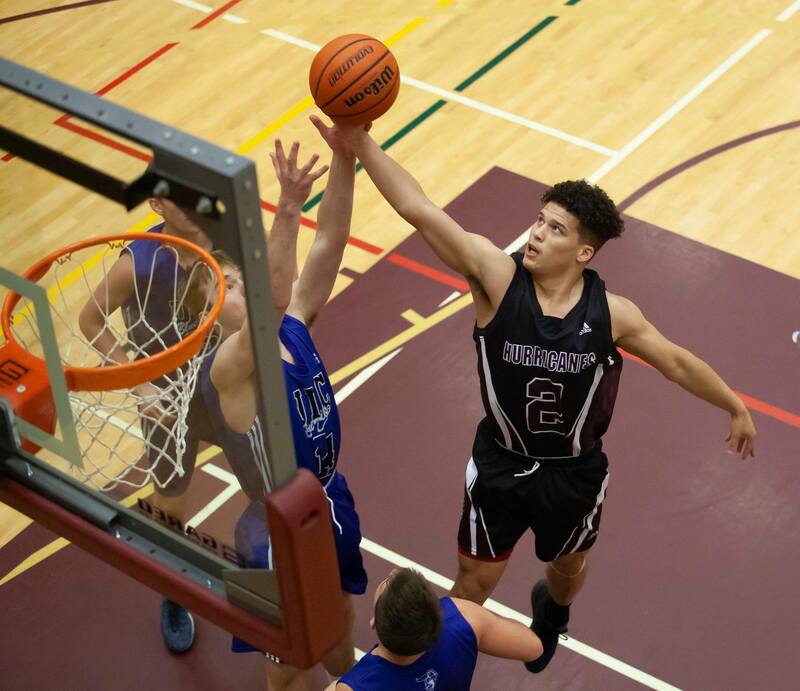 Thee Holland Hurricanes men’s and women’s basketball teams won all four games over the weekend at the Holland College Centre for Community Engagement. On Sunday they defeated the Dal AC Rams before sweeping the UKC Blue Devils on Sunday. In Saturday’s women’s game versus the Rams, the ‘Canes scored the first 28 points of the game and never looked back en route to a 112-20 victory. The ‘Canes led by quarter scores of 38-2, 68-11, and 91-15. Ashley Plaggenhoef led a balanced attack from the Hurricanes with 21 points, while adding five rebounds, seven assists, five steals, and one block. Lexi MacInnis and Briontae Riley both had 18 points, with Sydney Goode (14), Kassandra Little (13), Antenique Young (11) all reaching double figures in the win. Riley added nine rebounds and five steals, Little added eight rebounds, three assists, two steals, and a block and MacInnis added five rebounds, three assists, two steals, and four blocks. The Rams dropped to 0-4 on the season with the loss. On Sunday, the ‘Canes and Blue Devils traded baskets in the first half with UKC leading 33-29 entering the half. The Hurricanes would use a pair of quick threes at the start of the second half to propel them to the lead; they would eventually win the game 76-61. Jayla Verney had 20 points to lead the ‘Canes offense while also adding five rebounds and seven assists. Plaggenhoef and Tyleigha Nelson both had 16 points with Lexi MacInnis adding 15 in the win. Plaggenhoef added seven rebounds, three assists, and three steals with Nelson chipping in with nine rebounds, six assists, three steals, and two blocks. The ‘Canes improve to 3-3 on the season and now sit in a tie for third in the ACAA while the Blue Devils are in a three-way tie for fifth with a 2-3 record. In the men’s game on Saturday, the ‘Canes scored early and often in a 119-43 victory over the Rams. The ‘Canes led 30-10 after the first quarter, 68-25 at the half, and 98-31 after three. Jace Colley and Antonio Kostakos both had 24 points each to lead a balanced offensive attack. Colley added 13 rebounds, six assists, one steal, and two blocks, while Kostakos had six rebounds, four assists, and two steals. Jordan Holness and Roosevelt Whyley each had double-doubles in the game with Holness recording 12 points, 14 rebounds, seven assists, three steals, and a block and Whyley having 10 rebounds, four assists, and two blocks. Martin Campbell also reached double figures and finished with 19 points, eight rebounds, six assists, and three steals. The Rams dropped to 0-4 with Saturday’s loss. On Sunday, the high-octane Hurricanes offense continued to roll as they knocked off the Blue Devils 120-65. The ‘Canes jumped out to a 36-20 lead after one, extending it to 69-30 at the half, and 100-47 after three. Colley once again led the offense with 25 points to go along with seven rebounds, seven assists, one steal, and one block. Whyley added another double-double with 17 points, 11 rebounds, four assists, three steals, and three blocks. Campbell had 16 points while Holness recorded 15 points, four assists, and six steals. Agak Lual had ten points and 11 rebounds off the bench for his first double-double this season while Kostakos continued to be a key contributor off the bench with 14 points. The ‘Canes are now 6-0 to start the season and lead the conference while the Blue Devils are 2-3 and in fifth place. The Hurricanes return to action this Friday evening when they host the Mount Allison Mounties at the Holland College Centre for Community Engagement; the women’s game begins at 6pm with the men’s to follow at 8pm.